Carrie received her undergraduate degree in Psychology from Rockhurst University and her Master’s degree in Communication Disorders from Fontbonne University. She previously worked for Special School District of St. Louis County, as well as a birth-to-three early intervention program in Johnson County, Kansas. Carrie is certified in The Hanen Centre’s It Takes Two to Talk parent training program, as well as The Hanen Centre’s Learning Language and Loving It program. 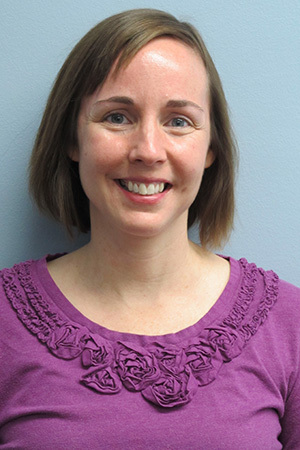 She co-leads one of the preschool language groups, conducts screenings and evaluations, provides individual therapy and parent training, and supervises graduate student clinicians. Carrie loves working with young children and their families, which is why she has enjoyed working at the Walker Scottish Rite Clinic since 2004. A fun fact about Carrie is that she enjoys traveling, especially to warm beach destinations!